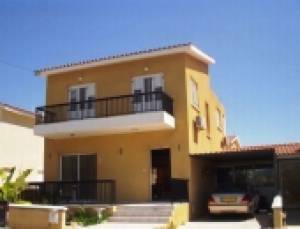 A 4 bedroom detached (Resale) house in Anavargos-Paphos with fantastic sea & mountain views. It is situated in a quiet and convenient location, close to all amenities, 5 minutes to Paphos centre. The main bedroom has an en-suite. All bedrooms have balconies, air/condition units, double glazed aluminium windows & modern shutters. There is a good sized kitchen with all kitchen appliances (gas top cooker, electric oven) including dishwasher, storage room under the stairs, extra room on the main floor that can be used as a play room/office or guest bedroom. At the back of the house there is another generous sized storage room & laundry room. There is a front garden & drive ways on both sides of the house. It also has a carport.